playwrights. He was a contemporary with Henrik Ibsen, Hans Christian Andersen, Sören Kierkegaard and Knut Hamsun and equally influential on the literary scene. The Red Room (1879). As a playwright he strived to be impartial and objective. Miss Julie. Later he was considered to be one of the pioneers of the modern European Stage when he turned towards symbolism and expressionism. Ett drömspel (A Dream Play,) Spöksonaten (A Ghost Sonata) and Dödsdansen (The Dance of Death) are a few famous plays from this era. The Strindberg Museum in Stockholm. feelings towards Cousin Adele, while Kerstin and Axel are in heat. Mr. Bengt’s Wife is the passionate story of Margit, an orphan and rebellious novice who breaks her convent vows to marry her “Knight”, Lord Bengt, a wealthy landowner. Her husband’s fortunes soon dwindle, and she seeks her freedom from her approaching poverty. As her marriage dissolves. she is hotly pursued by the convent Priest, and a childhood friend who is now the Bailiff of the town. Her love/hate relationship with Bengt also continues, adding to Margit’s personal revolution with 19th century society’s view of women and the emerging feminist movement. Seeking to end her life, Margit finds herself a “new woman”, who will engage with men, women and society on her own terms. 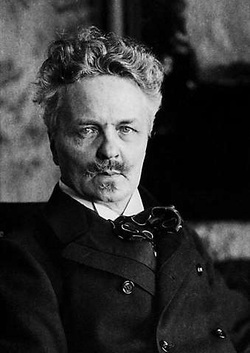 Mr. Bengt’s Wife is Strindberg’s rebuttal to Henrik Ibsen’s, A Doll’s House, interweaving scenes of realism and dreamscape into a powerful dramatic work from one of the masters of modernism. A Comedy in four acts. This is the third play we are currently working on, and is now in the process of being translated from Swedish to English for the first time. This play is about a few craft’s men who are part of a club that is responsible for building and finishing a cathedral in the village. There is secret handed down to each alderman of the society of how to build so the church tower will hold up against the natural elements. There is a power struggle within the guild about who has the secret and who should be the next alderman. Jealousy, lies and attempted murder are all things going on, ending in catastrophe. It is believed that Strindberg may have used the cathedral of Uppsala as inspiration for this story as it collapsed once during construction. The English title would be "A half sheet of paper" from "Stories". It's about a man reminising after losing his wife.